The RNT-HAL-2X150MCE-LED-E2E Portable Telescoping Explosion Proof LED Light Tower from Larson Electronics produces 35,000 lumens of light capable of illuminating an area 14,500 square feet in size. This adjustable Cree LED light tower is designed for portability and durable operation and ideal for use in demanding conditions. Equipped with a wheeled base, two adjustable Cree LED light heads, and 100` of SOOW cable terminated in an explosion proof 20A receptacle that allows for daisy chaining, this explosion proof LED light tower is ideal for hazardous locations requiring quality portable lighting. The RNT-HAL-2X150MCE-LED-E2E is rated for use in Class I Division 2, Class II Divisions 1 & 2 and Class III Divisions 1 & 2 hazardous locations. 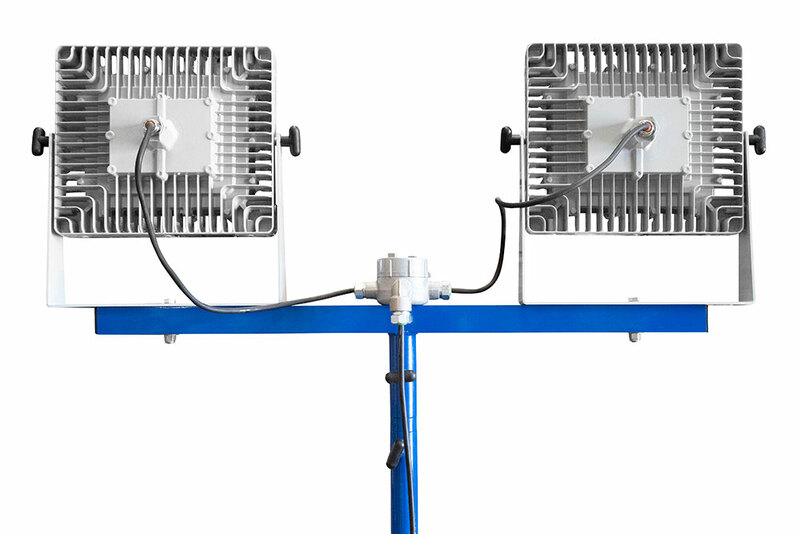 The RNT-HAL-2X150MCE-LED-E2E is a wheeled tower mounted explosion proof LED lighting system that can be connected end to end with up to 5 additional light towers using the included explosion proof 20A receptacle. 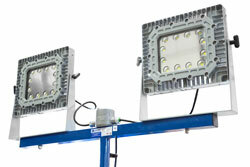 This light tower provides 14,500 square feet of work area coverage with 35,000 lumens of light output. This portable LED light tower has a removable LED light head mounted on top of a telescoping light tower equipped with a wheeled base for easy positioning of the unit from one area of the workspace to another. 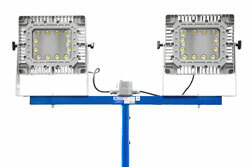 The LED light head on this unit produces a wide flood pattern of light that is ideal for illuminating large workspaces and jobsites. This light is designed for heavy duty use in demanding conditions including emergency services, mining, construction, marine, and industrial operations where durability and reliability is critical.